Construction projects under way in Riyadh. After a successful first edition, Stone & Surface Saudi Arabia is returning to Jeddah next month with a bigger and more comprehensive showcase of products. The event will be held at the Jeddah Centre for Forums and Events from April 10 to 12, co-located with The Hotel Show Saudi Arabia 2018. 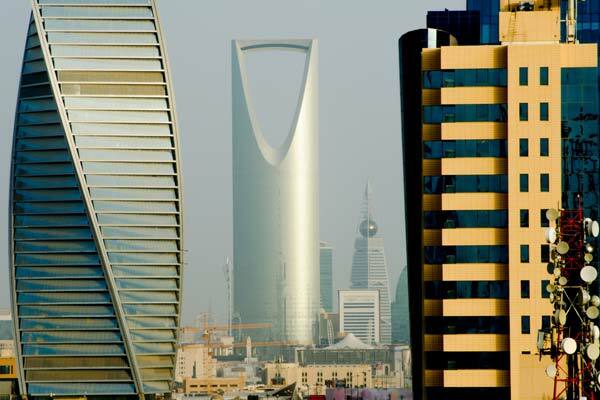 With almost 5,000 projects in the pipeline, Saudi Arabia is fast becoming one of the world’s busiest markets for construction – led by urban development and a growing transport network. A new ‘Saudi Arabia Construction Overview’ report by market analysts BNC Network – prepared ahead of Stone & Surface Saudi 2018 – has priced the 4,778 projects in various stages of development across the kingdom at $839.1 billion. In line with Saudi Vision 2030, the kingdom is taking significant measures to improve its infrastructure to further its position as a destination for business and leisure tourism, enhance its religious tourism sector, and cater to the needs of its growing population. “A change of regulations has green-lighted the creation of the entertainment sector and industries related to it, while a rapidly growing population and urbanisation increase the provisions for basic services such as healthcare, education, energy, water, and roads,” explained Avin Gidwani, CEO of BNC Network. Due to the increase in construction projects, there has been a surge in demand for the materials needed to fulfil the significant production and building requirements – none more so than stone. Stone & Surface Saudi Arabia was launched in the Kingdom last year to provide a platform dedicated to connecting construction professionals with suppliers of natural stone and other materials for surface design, including from some of the world’s biggest international quarries. Yan Wang, event director of Stone & Surface Saudi Arabia, said: “The increase in construction activity throughout the kingdom is creating widespread demand for stone, essential for this region with its continued position as a preferred material for external applications due to its weather conditions. Stone is at the very centre of the thousands of urban construction projects ongoing across Saudi, including residential and commercial buildings, economic zones, hospitals, and hotels. High-end and ultra-high-end projects currently underway throughout the kingdom are a major market for more exquisite and natural stones, which will be brought to the show from quarries covering a range of countries including Turkey, China and Canada. “Trending this year are natural stones including marble, granite, travertine, slate, and limestone – likely to feature heavily across the kingdom’s mega construction projects,” added Wang. Turkey, one of the world’s largest natural stone reserves, has the biggest presence at the event this year. Meanwhile, exhibitors will also showcase a wider range of surface design materials from solid wood flooring all the way from Italy (Triveneta Parchetti) to ceramic tiles from one of the leading manufacturers in the Middle East (Arabian Ceramics).